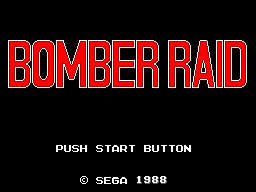 Bomber Raid is a vertical shoot em up. 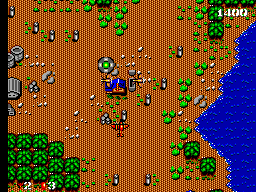 The idea of the game is to destroy the main target and take down as many baddies while on your way. 5 missions may not seem much but they're a challenge. The game is simple to play, just press the fire button to shoot your main guns. There are some power ups to be had which are dropped as letters 'P' for a stronger main gun a 'S' for extra speed and a number of 1 or 2 which brings along an extra squdron plane or 2 when you shoot the numbers again this refroms your squadron. Button drops a big bomb which is handy to help weaken the mid and end of level bosses. The game can be made a lot easier if you use a rapid fire unit. 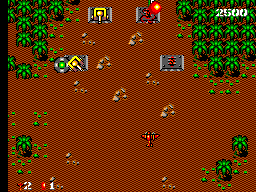 The game looks like Toaplan's Twin Hawk on the Mega Drive, with nice clear planes, ships and tanks. The backdrops are nice too and scroll smoothly. The enemy attackers are smoothly animated too so no problems there. The music is fine with so-so sound effects. They're not bad but not brilliant. The music is the better of the two. It's very simple to play but in the beginning the plane feels sluggish with out any speed ups. But it does play well. Until you crack it there is plenty here to bring you back for more. There are some ace shoot-em-ups on the Master System and this sits in the middle of them. If the power-ups were a bit better then maybe this might have made it more fun to play but it is not a bad game.